Celebrate the holidays, special occasions and more at Sheraton Grand Danang Resort, a stylish 5-star beachside resort on the stunning white sands of Non Nuoc beach. An expansive luxury retreat alongside the white sands and tranquil blue waters of the East Vietnam Sea, Sheraton Grand Danang Resort is offering 10 ways to celebrate upcoming holidays, anniversaries and special occasions of all types. Moreover, the luxury Sheraton Grand Danang offers the perfect hub from which to enjoy Danang’s top attractions, including its best beaches and UNESCO Heritage landmarks like Hoi An Old Town and Hue Ancient Capital. Offered through 2/10/18; rates from 6800000 – 11000000 VND per night. Offered through 11/3/2019; rates from 7500000 – 12500000 VND per night. 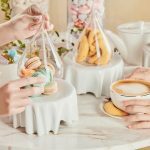 Sweet Symphonies – Celebrate Vietnam’s Tết holidays with a selection of delectable desserts from a sumptuous buffet with over 15 sweet treats, including cakes, eclairs, scones, tiramisu, colorful macaroons served with tea and coffee. Offered on 2/1 and 2/2 from 3 – 6pm at Tea Lounge; offered at 288000 VND per guest plus tax/service charges. 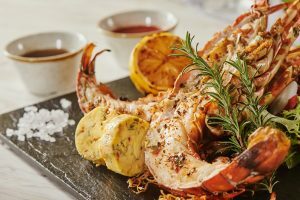 Tết Family Brunch – A celebration for the entire family at La Plage, where classic Asian bites and signature are served up poolside with panoramic ocean views. 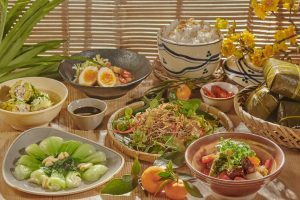 The bountiful, all-you-can-eat buffet brunch features an extensive array of Vietnamese delicacies, including aromatic soups, salads, hot noodles, fresh spring rolls, mouthwatering meats and more, followed by a delectable selection of signature sweets.Offered from 2/1 – 2/10/2019 at La Plage; offered at 588000 VND per guest plus tax/service charges, including free-flow non-alcoholic beverage. Offered on February 14 at 1,288,000 per guest with glass of sparkling wine; 1,888,000 per guest with wine pairing. Reservations required. Private BBQ Dinner – A private beach barbecue dinner prepared by Sheraton Grand Danang’s expert culinary team. Features freshly grilled meats and seafood prepared at the beach, poolside or in the comfort of your own room. 3880000 plus tax/service charges per couple, inclusive of bottle of sparkling wine. Offered through 10/19/19; rates from 5300000 – 8300000 VND per night. Offered through 10/30/19; rates from 6600000 – 11600000 VND per night. Stay and Play – Celebrate a special occasion with a golf getaway at Sheraton Grand Resort, where guests enjoy privileges at Danang’s finest 18-hole championship golf course designed by Greg Norman. Offered through 6/30/19; rates from 5700000 – 8700000 VND per night.